The 15 machines of class EP08 (nicknamed “świnie” = “pigs”) were, in their day, the fastest locos in Poland. Built by Pafawag in Wrocław in the 1970s, these speedy 3000V dc Bo-Bos were identified by being painted in orange liveries among a general sea of green! The above is a link to a YouTube video uploaded by user Tofi 720p of the class leader, EP08-001 now back in its “heritage” orange livery, departing Wrocław, 21st July 2017. Developed from the EU07 universal electric loco design being manufactured by Pafawag under licence from English Electric (based on the EU06 type from the Vulcan Foundry), were designed for 160km/h (100mph), but with a top plated speed of 140km/h. For such a small class, it’s perhaps surprising to consider that they came in three distinct variants. Type 102E consisted of just the class prototype, EP08-001. Built in 1968, it did not enter traffic with PKP until 20th March 1973. Considerably younger than the prototype, yet entering traffic sooner (in the last two months of 1972), were the four locos of type 4Ea; EP08-002 to EP08-005, built with plain bearings and EE541b traction motors. The final batch, type 103E, accounted for the final 10 locomotives of the fleet: EP08-006 to EP08-015, equipped with roller bearings and EE541c traction motors (as in EP08-001) entered traffic between December 1975 and February 1976. The 15 EP08s only operated simultaneously as EP08s for a few months, as the four 4Eas were very soon converted to “standard” EU07s between August 1976 and November 1977, as the plain bearings were not suited to the high speed work. These four took the numbers EU07-241 to EU07-244 in the order that they emerged from Gliwice works (005 > 002 > 004 > 003). The remaining 11 settled in, as with most express electrics the world over, clocking up the miles in a relatively workaday fashion. Sadly, despite the success of the EP08 design, no more were built. This was mainly a direct result of the decision to go for the roller bearings, which had to be imported, for which the finance was not there. Future machines were all built to the “universal” EU07 design, which continued to be produced until 1994. Facing the same challenges as most Eastern European railway networks, it was not until the 1970s that PKP was in a position to begin the development of an express passenger network, and the EP08s were integral to this – although, at the time of their introduction, there was no Polish railway on which they could really show their capabilities. 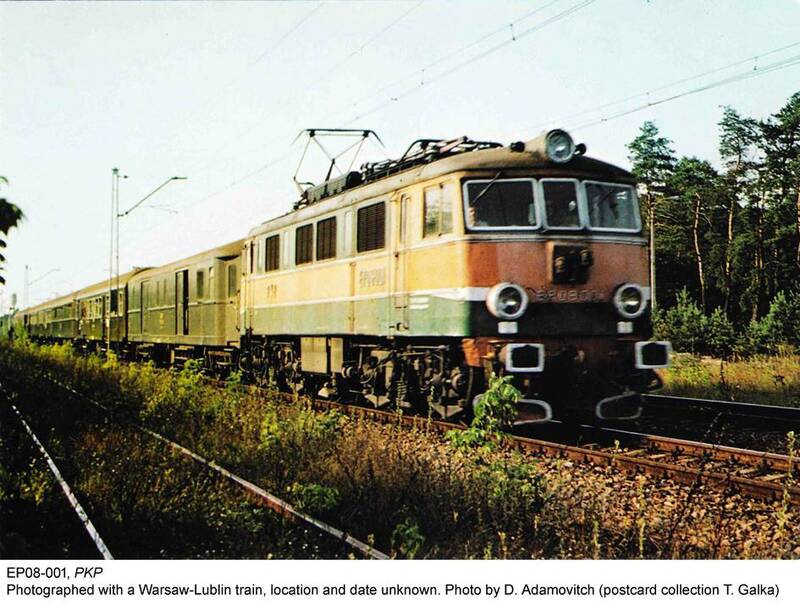 They eventually saw use on the high-speed CMK (Centralna Magistrala Kolejowa – the imaginatively-named “Central Railway Line”) which had been built between 1971 and 1977, but which did not carry express passenger services until the mid-1980s. The EP08s remained the fastest locos in the country until the arrival of the 160km/h class EP09 – the two prototypes in 1987 and the 45 production examples between 1990 and 1998. They remain in frontline passenger usage, mainly on TLK services, where their 140km/h capability can be exploited. Above is a link to a YouTube video uploaded by KolejFilmy showing EP08-008 flying through Krzewie. The first EP08 casualty was EP08-015, which was the unfortunate loco in the Bednary collision on 9th December 1994 (some photos here). The EP08 was hauling IC1703 (“Lech”), the 15:30 express passenger train from Warszawa Wschodnia to Poznan Główny at approximately 100km/h, when it collided at approximately 16:25 with a derailed freight train hauled by ET22-461. 67 were injured, 1 – a lady who had been walking through the train at the time – fatally so. It is said that the collision occurred with such force that the sound of the impact could be heard 5km away. EP08-014 was sidelined at the end of the 1999/2000 financial year and later scrapped, but for the last 17 years, the fleet has remained constant at 9 members. Sadly, on 18th September 2017, EP08-006 was damaged in an accident at Kobylnica whilst hauling TLK18102, with more than 20 people injured. One pleasing aspect of Polish railways at the moment is the significant number of heritage repaints that are springing up. The EP08s have not been left out – EP08-001 herself was released into traffic in a fresh coat of orange paint on 26th May 2017, and is a frequently-photographed eye-catching sight on Intercity services. The others are in the standard blue and white livery of PKP Intercity.